A moist woodland under a bridge in New Jersey is about the last place you might expect to plant sage. But for insurance broker Ward Dasey -- a dedicated birder and gardener -- it was a desperate move to discourage deer that were over-browsing his favorite bird watching site. To understand why the drought-resistant Texas native Autumn Sage ( Salvia greggii) and other mint family members (Lamiaceae) began blooming at Palmyra Cove Nature Park, we need to take you back to the park's beginnings. Before World War II, marshland dominated the New Jersey side of the Delaware River beneath the Tacony-Palmyra Bridge about 100 miles northwest of Cape May. Palmyra is about 20 miles west of the Burlington County portion of the New Jersey Pine Barrens. During the war, dredging to deepen the river for shipping led to tons of sludge that had to go somewhere. It ended up in the marshes under the bridge. The muck turned into wooded wetlands that became what birders call a migrant trap -- an area that is a magnet for migratory birds and other wildlife. Migrant traps are rest stops for birds that need to fuel up on nectar, insects, rodents and fish before continuing their journeys to nesting grounds or back to winter homes. 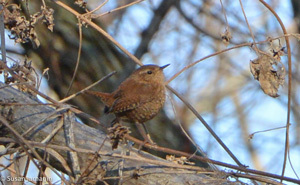 "Winter Wren" at Palmyra Cove Nature Park. Palmyra Cove is home to more than 250 species of birds, including Peregrine Falcons that nest on the bridge. 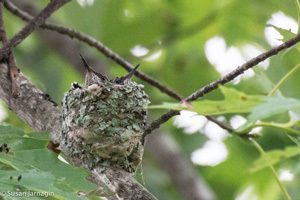 It provides habitat for Saw-whet and Great Horned owls, sparrows, warblers, the Red-shouldered Hawk, the Ruby-throated Hummingbird and, on occasion, the Rufous Hummingbird, which is more common in the West. Waterfowl include cormorants, herons and loons. The park provides a lengthy list of its feathered habitués (scroll down to "View all Bird Species") including information about the seasons in which you might sight them there. Keep in mind that although spring and fall are excellent times for bird watching, they are migratory periods of constant change. Audubon notes that the Peregrine Falcon and Pie-billed Grebe are conservation concerns at Palmyra Cove. It provides profiles of 39 park species (click on "see all"), including examples of their songs and calls. The bird sounds range from Bufflehead courting calls to the alarm and squealing calls of the Sharp-shinned Hawk. Discerning the difference between a call and a song can be difficult. However, here is Audubon's Beginner's Guide to Common Bird Sounds. By the late 1990s, Dasey and his fellow birders had to tromp through woods thick with prickly undergrowth to reach shore near the bridge. So they decided to ask the owners of the land -- the Burlington County Bridge Commission -- for funding to create a simple birding park. The birders reasoned that the Commission might be willing to pay for constructing a small parking lot and cutting a path through the morass of Stinging Nettle ( Urtica dioica). They got a lot more than they expected both in the form of help and four-legged hindrance. The Commission loved the park idea so much that they initiated funding for a much larger project resulting in a 250-acre park that includes a large visitor center. at Palmyra Cove Nature Park. The changes in Palmyra Cove "were fine" with the birders, Dasey recalls, until redevelopment led to beaucoup bucks of a different kind -- too many deer. The deer "browsed off most of the flowering plants causing insect populations to plummet," Dasey says. "The damage moved up the food chain effecting both migrant and nesting birds." Dasey says that he "jumped out of worry and panic" and decided that volunteerism would help the park's bird and butterfly populations. Remembering his introduction to nectar-rich, deer-resistant Salvias some years earlier, Dasey tried them at Palmyra. He propagated sages and other plants unpopular with deer while organizing a team of volunteers to plant them beginning in 2006.
enjoying Salvia x 'Scarlet Spires' at the park. They created what is now known as the Palmyra Cove Nature Park Nectar Gardens, a 700-foot-long median at the entrance to the park. Dasey notes that deer aren't the only problem that affects Palmyra Cove flora. Instead of rich ground, the soil is sandy, low-fertility river dredge. Also, supplemental watering isn't available for the Nectar Gardens, he says, because it is beyond the reach of a hose. "In other words, once plants get planted, they are on their own from day one," Dasey explains. "It must rain, and even here in the rainy east, we can go weeks without it." Threadleaf Giant Hyssop (Agastache rupestris). 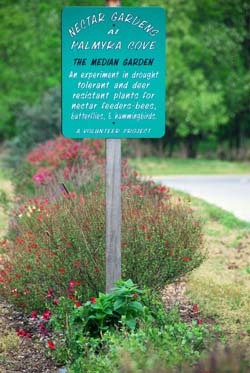 Salvia plantings at Palmyra Cove Nectar Gardens. Dasey discovered that his best waterwise choices for attracting butterflies are the Eastern species Mountain Mint ( Pycnanthemum virginianum) and Lesser Calaminth (Calamintha nepeta) as well as Purpletop Vervain (Verbena bonariensis), a non-native plant that is common to many parts of the West, the South and the East Coast. He notes that the western butterfly magnet Anise Hyssop (Agastache foeniculum) -- the basis of many FBTS hybrid Agastaches -- grows well at Palmyra Cove. "As much as possible, I like to use native plants," Dasey says,"but that isn't always possible when working in deer country." However, he adds that the non-natives must meet landscape needs and not be invasive. "The local birds and insects have an important say in what I grow," Dasey says. Here is his original Palmyra Cove plant list for anyone wanting to try some of the many Salvias and companion plants he has grown at the park. Dasey lives relatively close to Palmyra Cove. Because his team of volunteers is spread throughout the state, he sometimes feels challenged by "long days of weeding alone." He says it is the "good will and companionship" of the volunteers, as well as their work, that keep the project alive. Due to this dedicated volunteerism and "improving the quality of life through horticulture," the Nectar Gardens received an outstanding maintenance award from the Pennsylvania Horticultural Society. Finally, an important challenge the entire park faces is disruption of habitat by the ongoing process of dredging the Delaware River to keep it safe for shipping. It is a conundrum: Dredging -- the very thing that created Palmyra Cove -- harms the park's wildlife habitat as now established. Here is a video of recent dredging. In addition to his volunteer work at Palmyra Cove, Dasey is also a home gardener. He refers to his mélange of edibles and ornamentals as his "mad meadow and something for dinner," the products of which he regularly shares at work. View of the Mad Meadow. Photo courtesy of Ward Dasey. Dasey attributes his love of nature to his father and grandfather. "My father loved birds, plants and the produce that came out of Granddad's Delaware garden," he says. Dasey does a lot of his birding close to home. He estimates his life list at 650 different species viewed in North America with about 400 of those sightings in New Jersey. These days he mostly documents migrant birds at Palmyra Cove and participates in Christmas counts. Dasey's avocational duties once included serving as the regional editor for records of New Jersey Birds, a quarterly published by New Jersey Audubon. He held that position for 13 years. Dasey also volunteered as his county's coordinator for the New Jersey Breeding Bird Atlas. 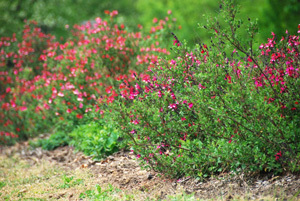 Flowers by the Sea asked Dasey what tips he would like to share about wildlife gardening. He says that "gardening is about finding out where you are" as in understanding the tuggings of your heart as well as your local zone and growing conditions. Read plant tags carefully; they are shorthand for proper cultivation. Research plants online before purchasing them. 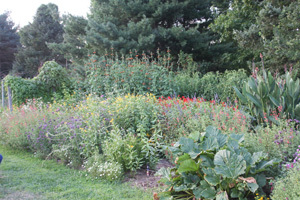 Attend tours of wildlife gardens -- or visit nature center gardens -- and ask questions. "Once you find a good plant, lean on it." Portraits in Gardening is an ongoing feature that focuses on FBTS customers who are passionate about Salvias and companion plants. 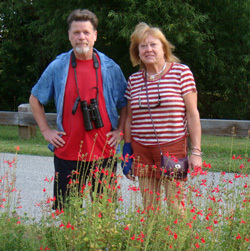 We thank Ward Dasey for his generosity in answering our questions and sharing his experiences with wildlife gardening. To volunteer as part of his team or to ask questions about wildlife gardening, please contact Dasey via Kristina Merola of the Burlington County Bridge Commission at kmerola@bcbridges.org. For more information about Portraits in Gardening or to ask about how our sages or companion plants might fit into your wildlife landscape, please write or email FBTS. We can help you figure out where you are. Ward Dasey is an unassuming individual who follows his heart and passion for all things in nature.... Ward has shared his knowledge of propagating nectar plants with our entire Hummingbird Forum and anyone who will pull up a chair for a few minutes to chat. I've learned to root cuttings, grow from seed and how to incorporate these plants into a wonderful garden to attract hummingbirds, butterflies, bees and many seed-eating birds. Ward is also an excellent birder and has an "ear" for bird song, which I envy. I'm not sure which passion came first, the seed or the birds, but the combination exploded into the huge nectar garden median in Palmyra, which he works unselfishly on because of his love of nature. He doesn't want recognition for his masterpiece, just to dig in it, learn from it and enjoy it with his fellow gardener pals. Having said that, volunteers are very hard to come by.... and finding like minded individuals to donate their time is not easy. The plants arrive in great condition and have started growing without any problems. The whole experience was very favorable. I highly recommend them.